Why not treat yourself to a Turkish belly dancing show onboard your crew charter yacht while on a yacht charter in Turkey? It is very easy to arrange an age old Turkish traditional belly dancing exhibition right on the aft deck of your charter yacht while on a crewed yacht charter along the southern coast of Turkey and enjoy a slice of traditional Turkish Culture. 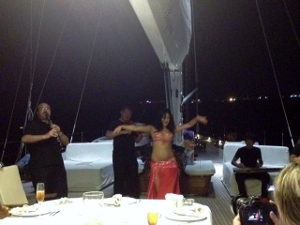 Recently on a yacht charter on the luxury Sailing Yacht Regina guests were treated to a special belly dancer exhibition including musicians playing different instruments as shown in the video above. The guests on board Regina had a fantastic time with the live music and dancing, and it was the perfect way to celebrate the birthday of one of the onboard guests while cruising along the Turkish Coast. Belly dancing is a cultural tradition, sometimes also referred to in the West as Middle Eastern dance or Arabic dance. Turkish dancers are known for their energetic, athletic (even gymnastic) style, and their adept use of finger cymbals, known as zils. Connoisseurs of Turkish dance often say that if a dancer cannot dance with zils, then the dancer is not a true Turkish Belly Dancer. Once described as “the dance that could melt a stone,” belly dancing is known as “Oriental Dance” in Turkey, which literally means “Eastern Dance”, and is very different from the “gobek dansi” or “stomach dance” which is danced by two men with faces painted on their bellies. The roots of the Turkish Oriental dance trace back to the Turkish Roma (“Gypsy”) culture, the harems, and the turn-of-the-century theaters in Istanbul. During the Ottoman Empire, the “çengis” [chain-gees] (dancing girls) and the “köçeks” [ko-cheks], (dancing boys), were all Roma, Greeks, Albanians, Circassians, and Jews as public dancing was considered undignified by the Turkish, with the Turkish Roma dancers considered the most skilled. During the Ottoman occupation of Egypt from 1517 to the early 1900’s, there was a merging of cultures (and dances) between the Turks and the Egyptians and they influenced each other. However, at some point belly dancing is belly dancing, no matter where it comes from and is a common language of movement. You too can enjoy a belly dancing show and even try your hand at belly dancing and feel a bit of the Turkish Culture while on a crewed yacht charter along the historic southern coast of Turkey.